Remember my adorable Crock-Pot? The one with the damask pattern my mom surprised me with? I used it like crazy over winter break, and now I’m back at it again, Crock-Pottin’ away (my new favorite verb). 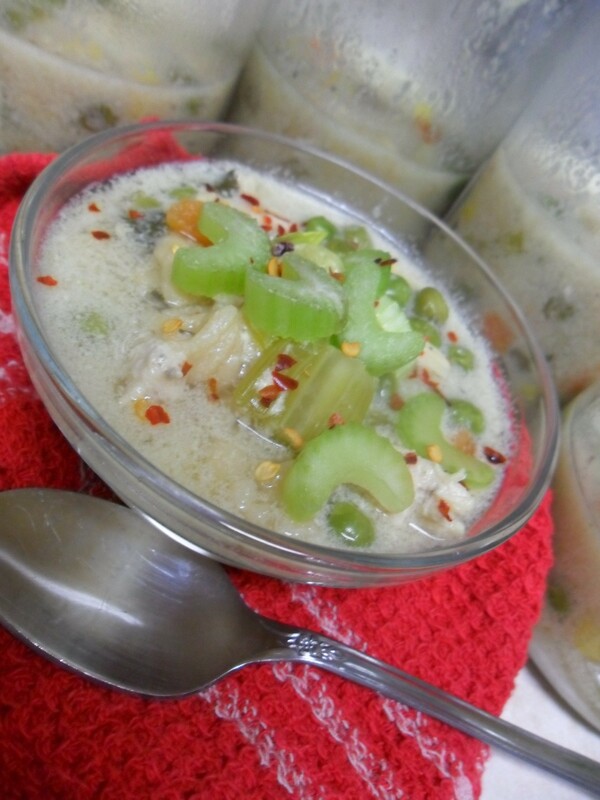 Lately, I’ve been using it a lot to create tasty soups. 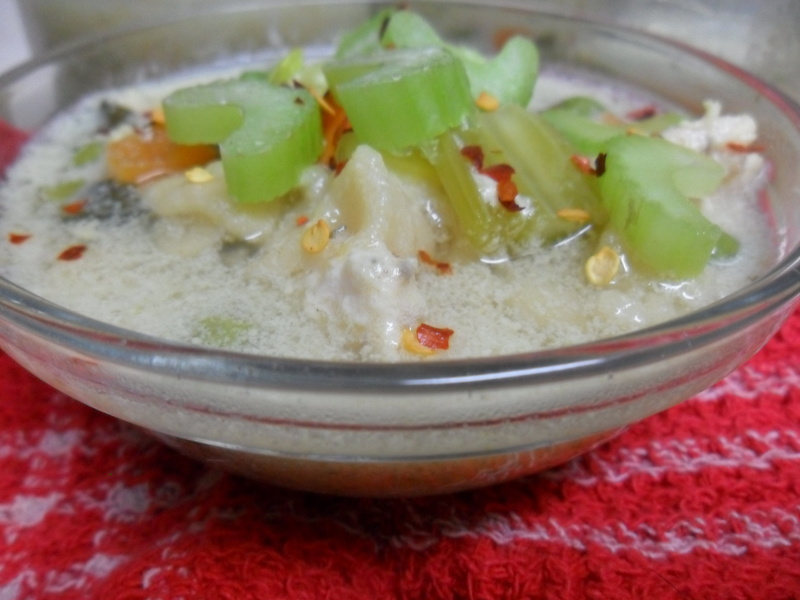 I’ve blogged about this before, lots actually, that I love making big portions of soup. Yes, this sort of goes against my single-serving approach, but it’s the one kind of cuisine I (1) can’t get enough of, and (2) one that I actually like having as leftovers. Why go against my usual routine? Because soups freeze so well. They almost never taste like leftovers. 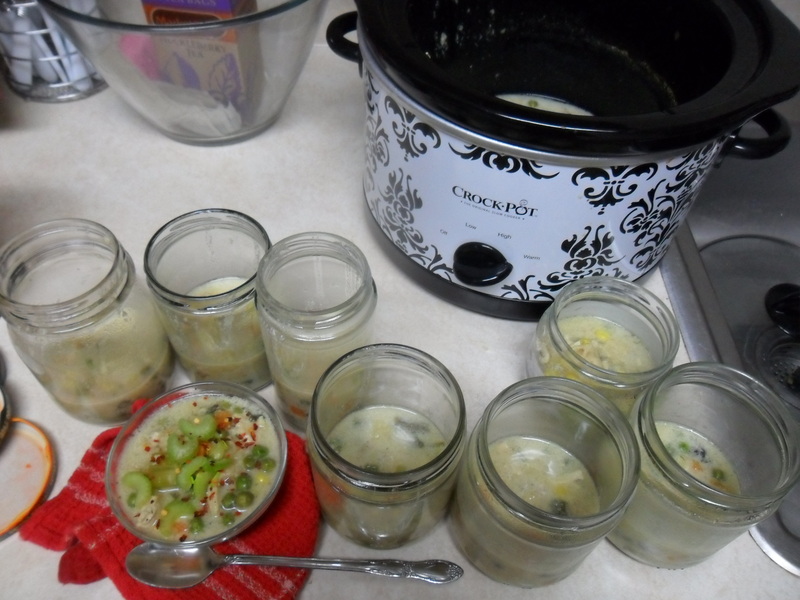 Here’s what I do: After making a big batch of soup, I portion the remaining soup out to mason jars and old glass salsa jars I’ve saved. I like to freeze in glass because it’s more sustainable, reheats well, and freezing glass doesn’t break down chemical compounds as plastic containers do. So anytime I need a quick lunch-on-the-go, I grab one from the freezer in the morning, let it thaw throughout the day (leading up to lunch), and then heat it right in the glass jar. It’s kind of fun eating soup from a little glass jar, but you can always pour it into a bowl if you don’t get a kick out of that like I do. -Turn the Crock-Pot on low if you have time to let it cook for 6-8 hours, high if you only have 3-4 hours. 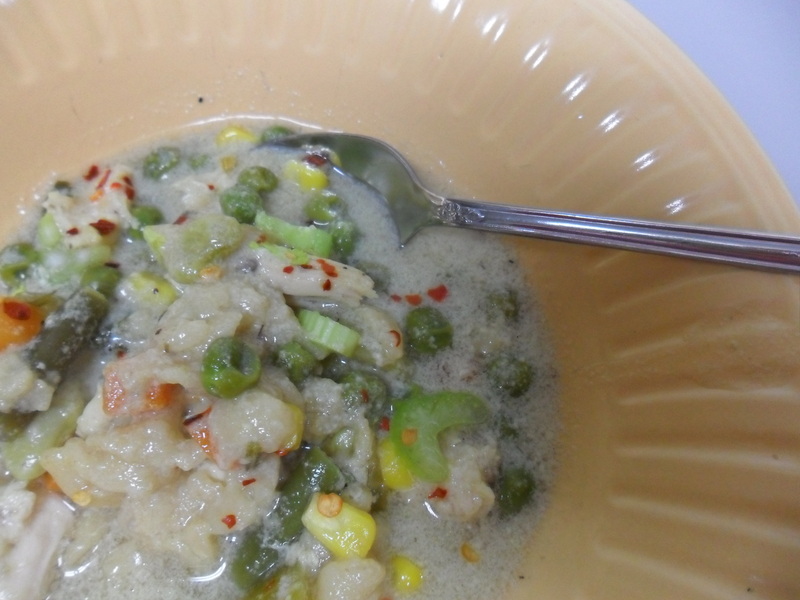 -Stir in water, then condensed soup until well blended. -Add in chicken, vegetables, and seasoning. Cover and cook. -About 20-30 minutes before serving, add in the dry noodles. If you’re using the low setting, switch now to high. Serve once noodles are tender. Doctors recommend that we eat salmon at least twice a week. My favorite health benefit of salmon, and there are many, is knowing that the omega-3 nutrients can help keep a brain sharp. It’s a little expensive, yes. But in my opinion, health and well-being are always worth splurging on. I usually eat my salmon atop a bed of fresh pasta and veggies. This is pretty routine for me. Routines are nice some nights, but I’m always looking for something new. I came across this idea while pinning. -Set oven to broil. Lightly grease a broil-safe pan. Set aside. 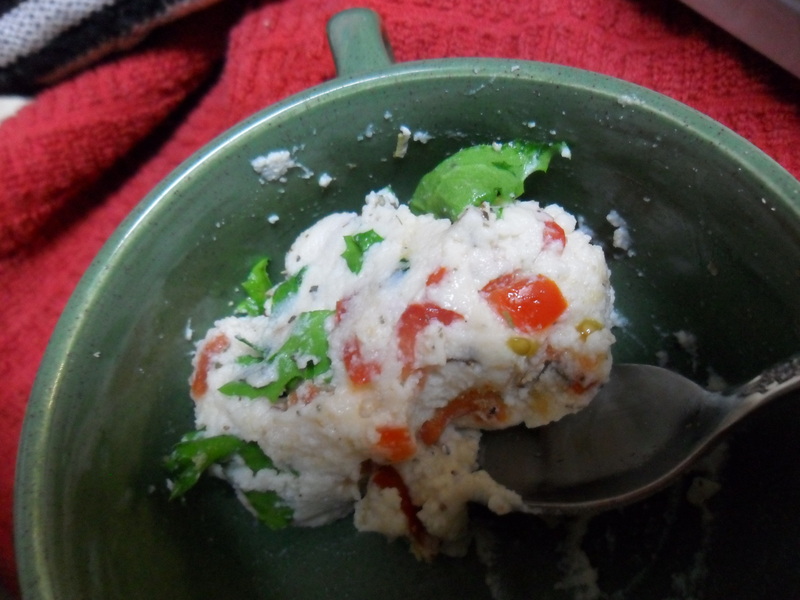 -Mix ricotta, kale, and seasonings in a small bowl. Place on the thicker end of the filet. 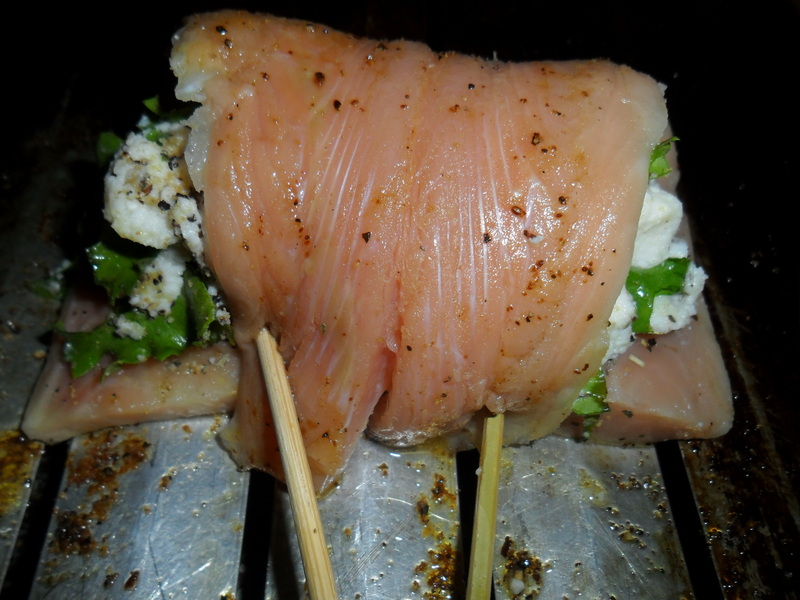 Slowly roll and pin together with oven-safe skewers. 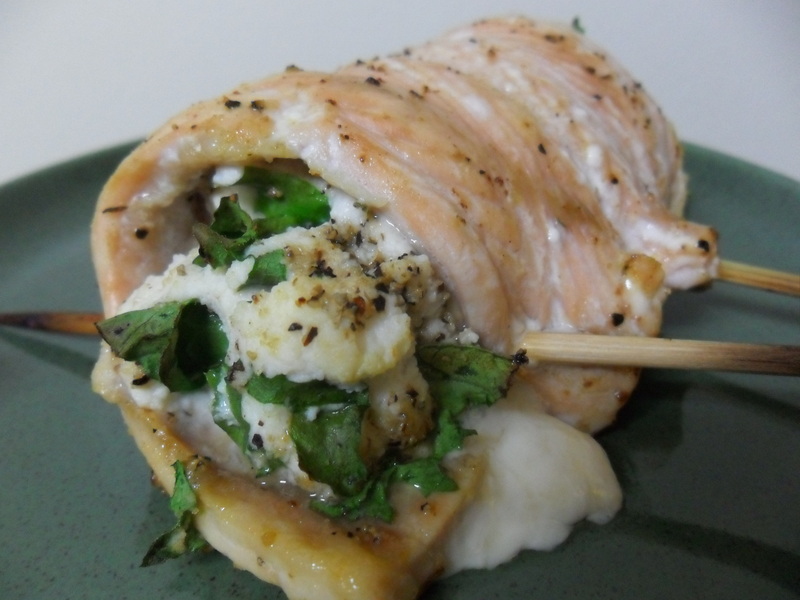 -Broil for about 4-5 minutes or until the salmon has cooked fully. A little pink color is good, but know that the insides of the roll will need more time than the outsides. 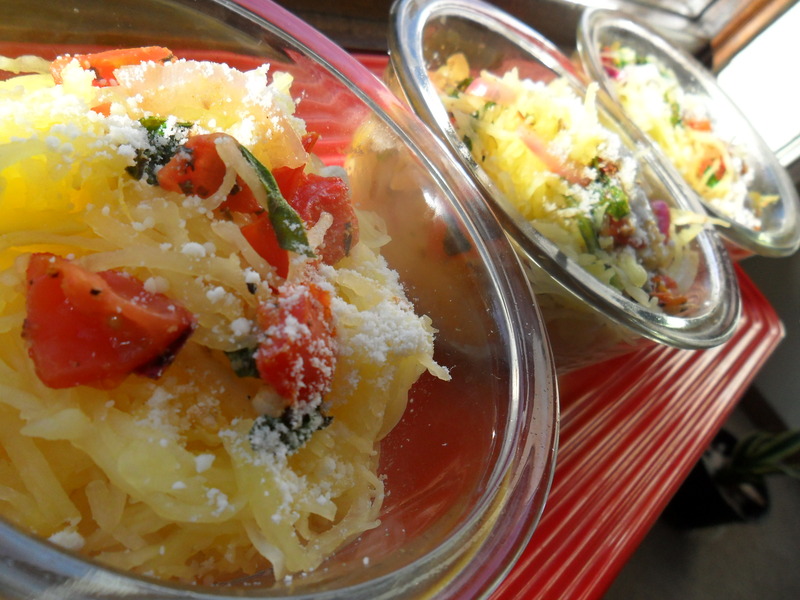 Serve warm, possibly atop a bed of pasta if you want to follow suit. If you follow this blog consistently, you probably already know this about me–heck, you probably know more than you’d like to about my philosophies on food, nutrition, and the value of a dynamic food presentation. 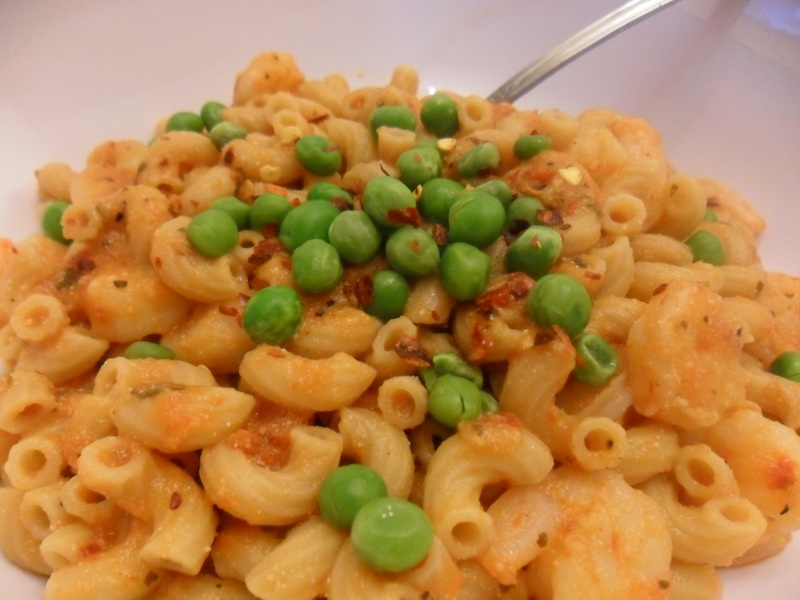 So you also know that my favorite weeknight supper standby features the following: a hearty whole-grain pasta, a rich tomato sauce, a sauteed veggie or two, and a featured protein. 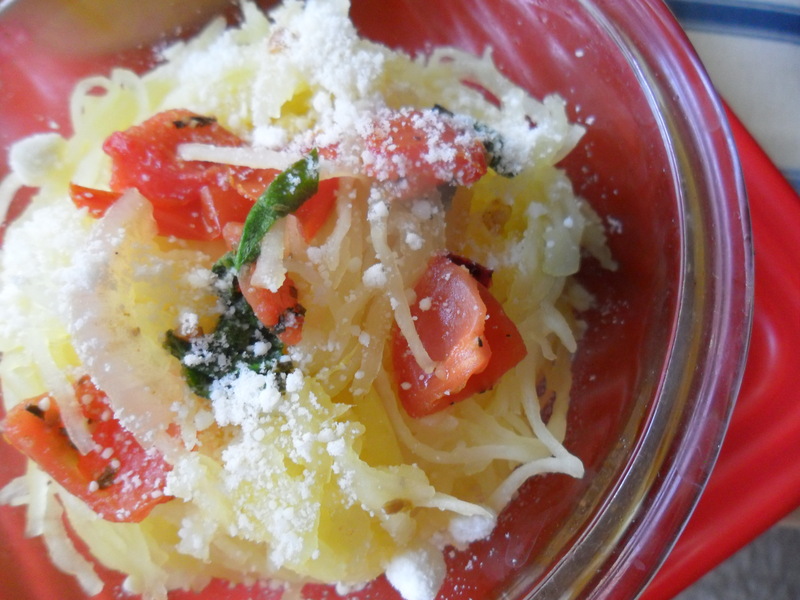 Sometimes I get crazy and top with Parmesan. What can I say? I live on the edge. No, I don’t. And this recipe isn’t exactly daring, but it is good, and it awakened by old standby one Monday evening. For a very small amount of effort, it’s amazing how much flavor and texture some breadcrumbs, kale, ricotta, and seasoning can do to an otherwise stolid dish. -Preheat oven to 425 degrees. Lightly grease a cookie sheet. Set aside. 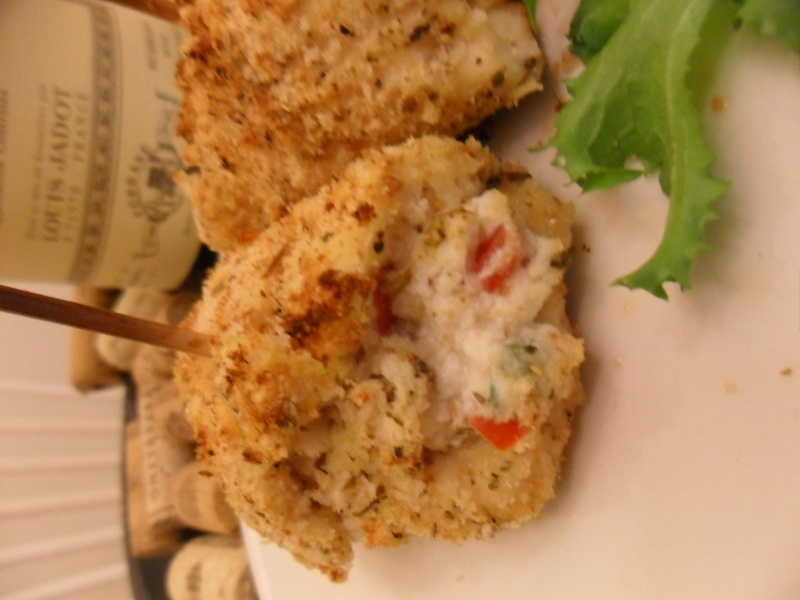 -In a bowl, mix all bread crumbs with the Parmesan and any seasonings you like. -Spray one side of each chicken breast with the cooking spray. Dip in breadcrumb mix until evenly coated on one side (or both if you’d like more). 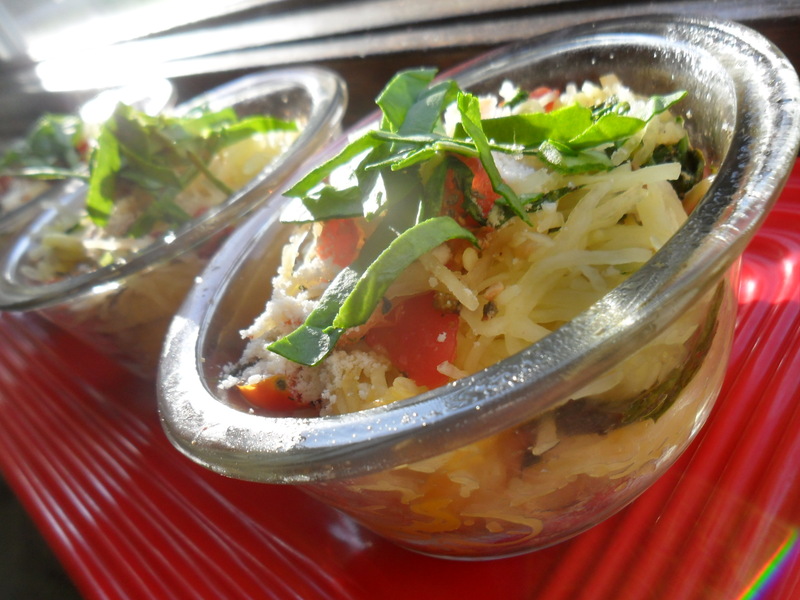 -In another bowl, mix ricotta, garlic, tomato bits, seasonings, and kale. 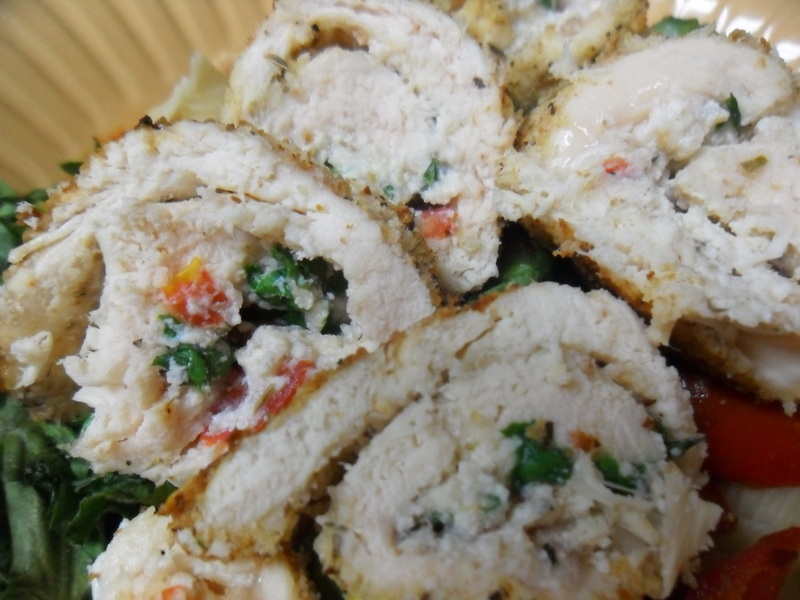 Spread cheese mixture on the thicker end of the chicken breast and begin to roll. Secure shut with toothpick or wooden skewer. 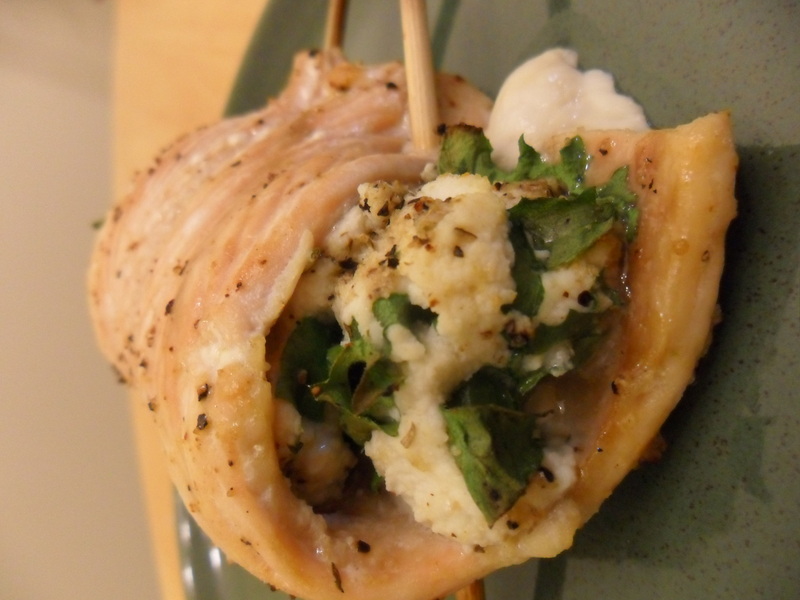 -Bake for about 15 minutes; then broil for 2-3 minutes. Remove from oven. 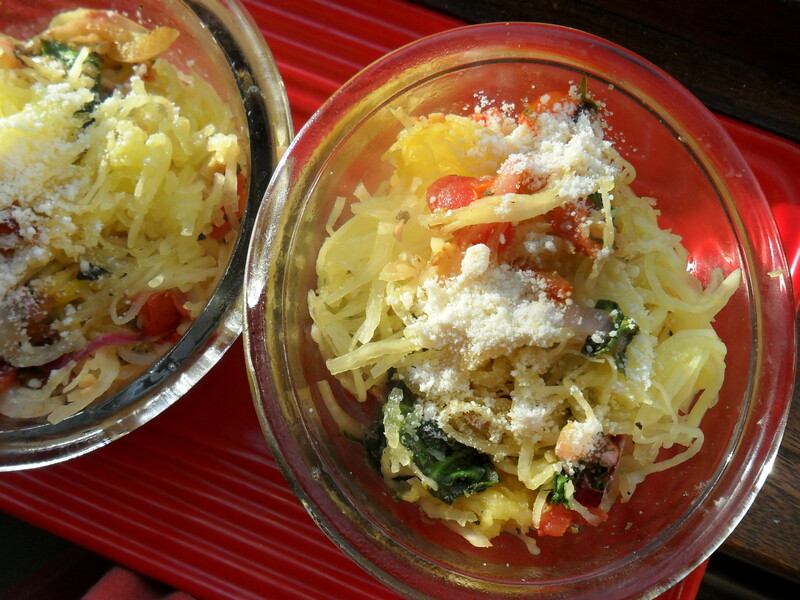 Let cool a bit, but serve warm as an entree or over a bed of fresh pasta and veggies. 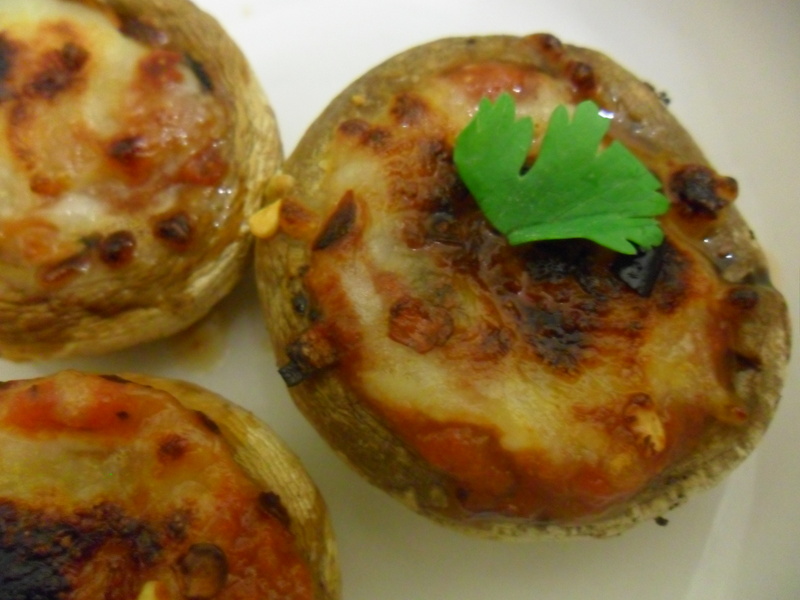 Everyone loves pizza, and everyone, I think, should love mushrooms. These healthy little treats are packed with nutritional goodness to fight cancer and stave off other unwelcome diseases. And they can be fun to eat. I promise. Just turn them into your favorite indulgence treat: pizza. This ‘za twist on a mini pizza makes a delicious addition to any pasta meal or make up a bunch for cocktails with friends. I bet they’d taste great paired with red vino. Optional Toppings: olives, artichoke hearts, pepperoni, etc. 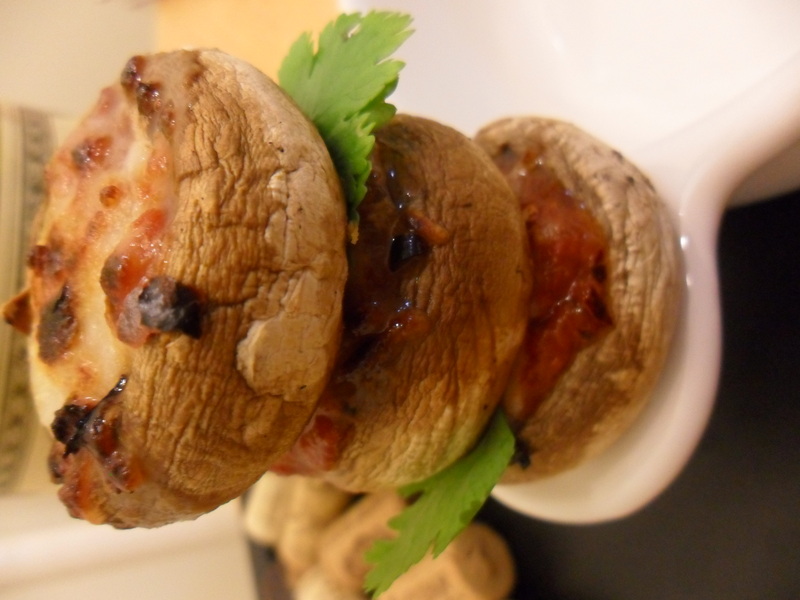 -Scoop a small amount of sauce into each portabella. Sprinkle with seasoning, a layer of cheese, and a little more seasoning. If you’re adding in toppings, place those on top of cheese. 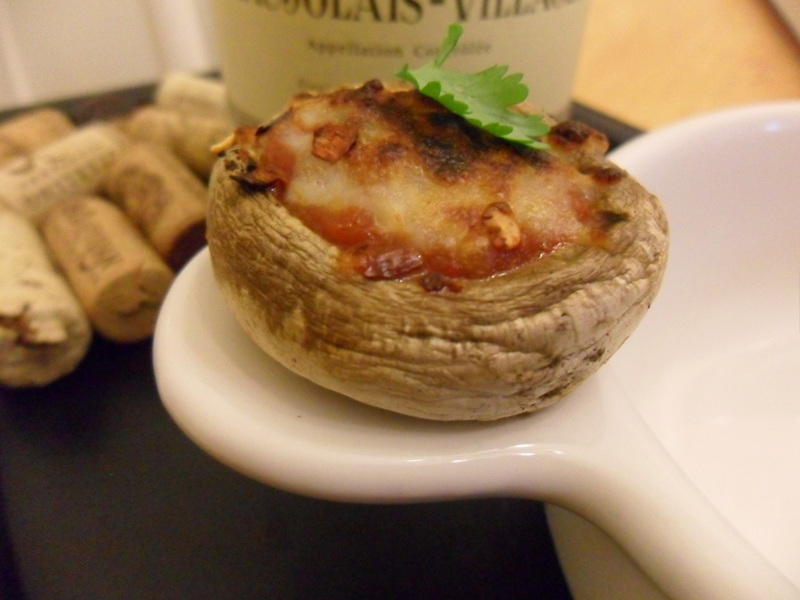 -Note that not much is needed in each portabella cap. -Bake in oven at 425 degrees for 15 minutes or so, or broil on high for 5 minutes. You’ll know they’re perfectly crisp and ready once the cheese bubbles and begins to brown a bit. Serve very warm. Ever wondered how restaurants make spicy cream sauces so good? It’s actually not that hard. 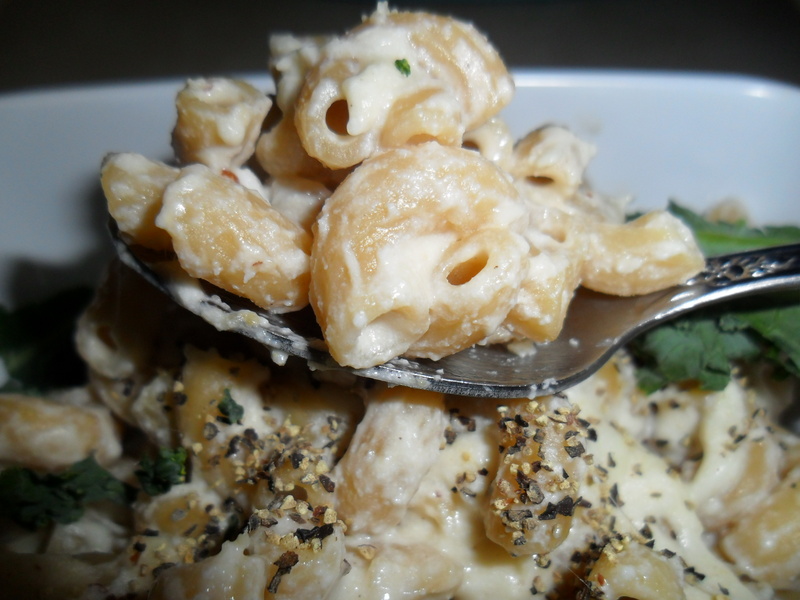 Take this spicy chicken rigatoni recipe I adapted from Buca di Beppo. Just a mix of red sauce, a little dairy or cream sauce. A quick boil, and a quick reduction, and BAM! Cream sauce (which we call pink sauce in St. Louis). But don’t forget the spice. That’s what gives the sauce life, right? Sidenote: I went a bit more Cajun with this one, opting for shrimp over chicken. But you could replace the shrimp with chicken if you like. – In a saucepan, heat oil. Sprinkle in red pepper, salt, and pepper. Then add garlic. -Meanwhile, cook pasta according to package directions. 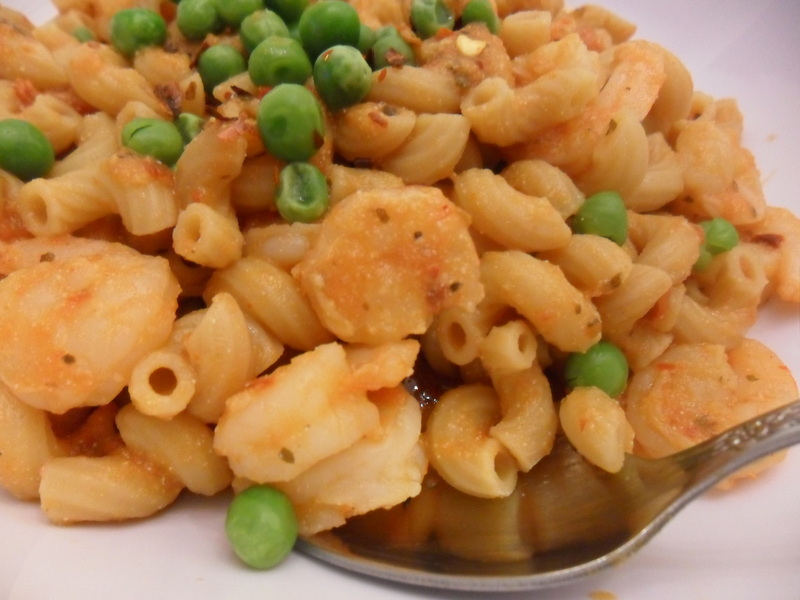 -After a few minutes of simmering, add shrimp to first saucepan. Let saute for about 3 minutes. Then mix in marinara sauce, then milk or Alfredo sauce. 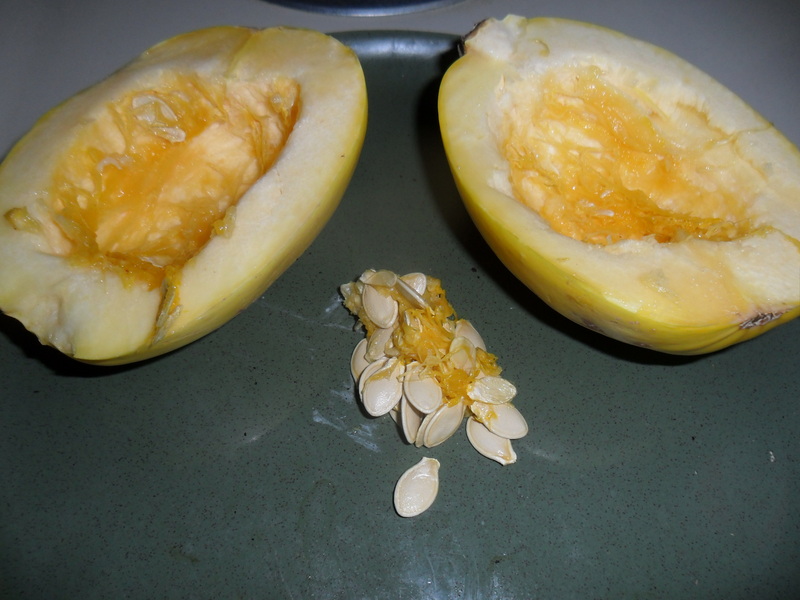 Bring to a quick, low-boil, and quickly reduce by removing from stove. Let thicken up a bit. 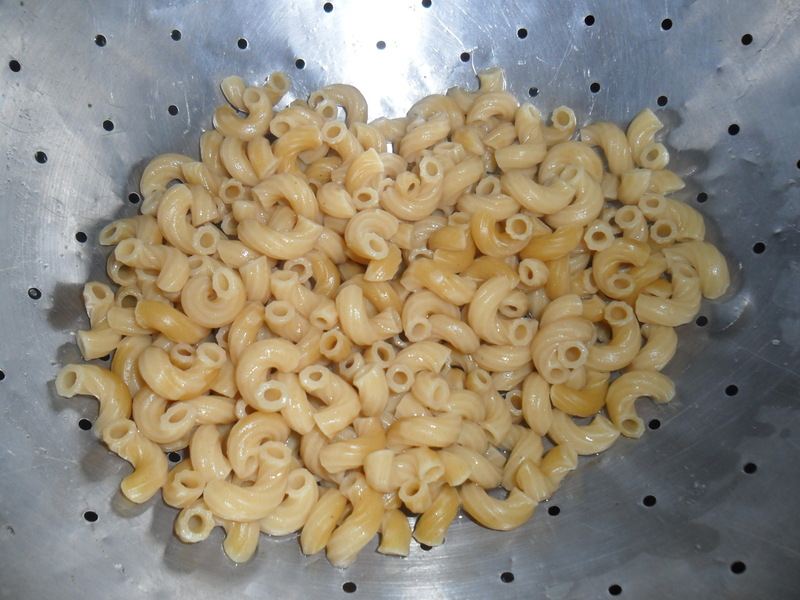 -Once pasta is prepared, drain thoroughly so no extra water ruins the sauce. Add pasta to sauce mixture and blend. Transfer to serving dish and sprinkle peas on top. Garnish with additional red pepper. 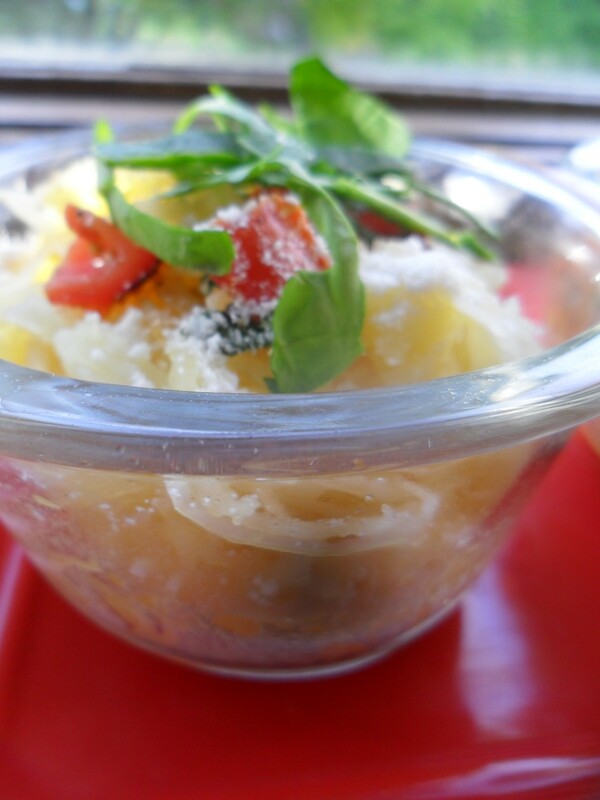 Wondering what I had for dessert to follow this spicy pasta dish? 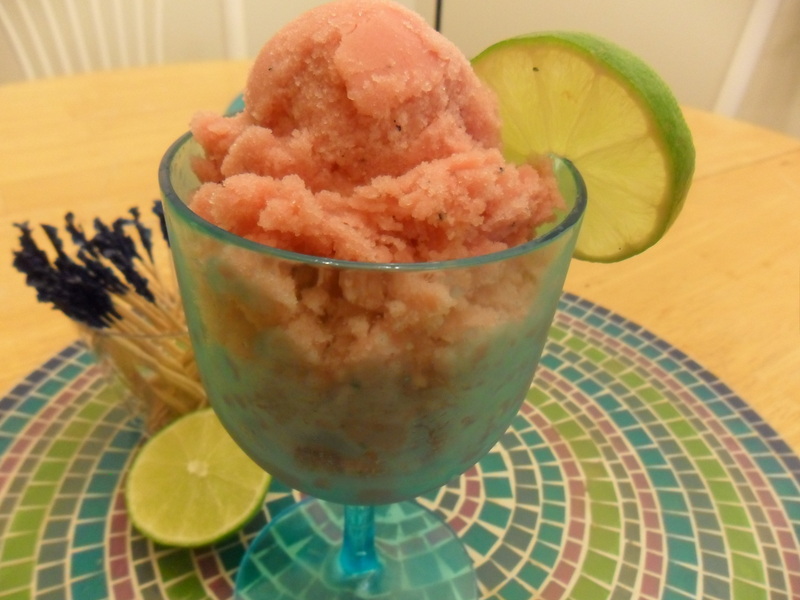 Watermelon ice cream! 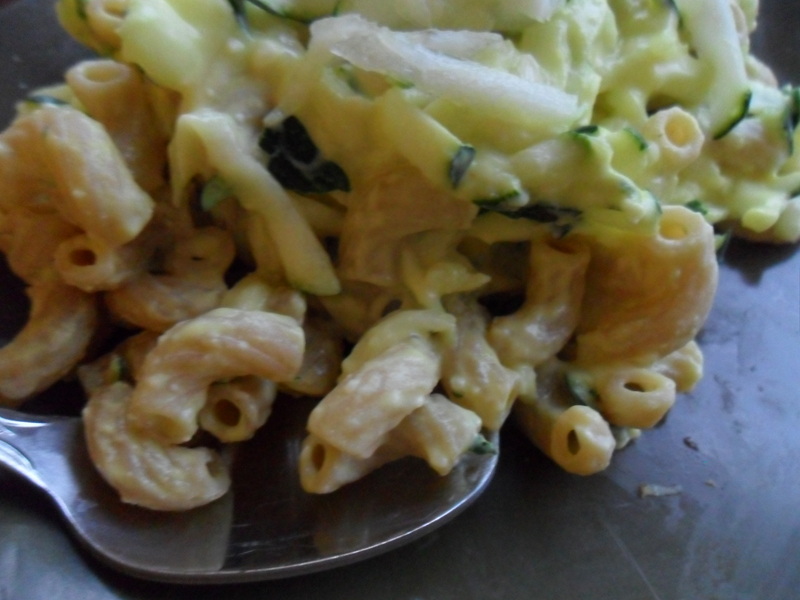 Do you want classic shell mac-and-cheese fast? 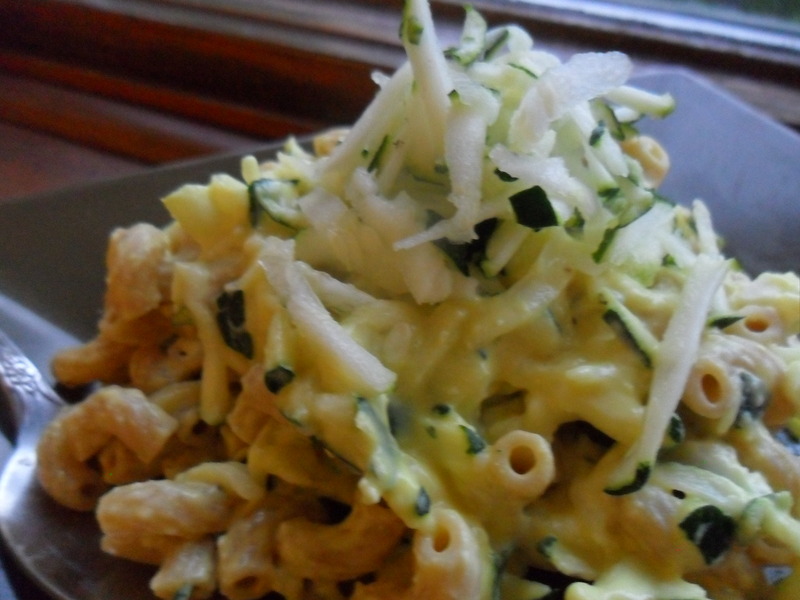 Well, this recipe is no Velveeta or EasyMac (thank goodness), it’s better. If you use a rich enough cheese, hearty wheat noodles, and a dash of mustard, you will not be let down. In fact, I think you’ll be scurrying to make another bowl. I’d recommend using a huge mug, like the one I used. 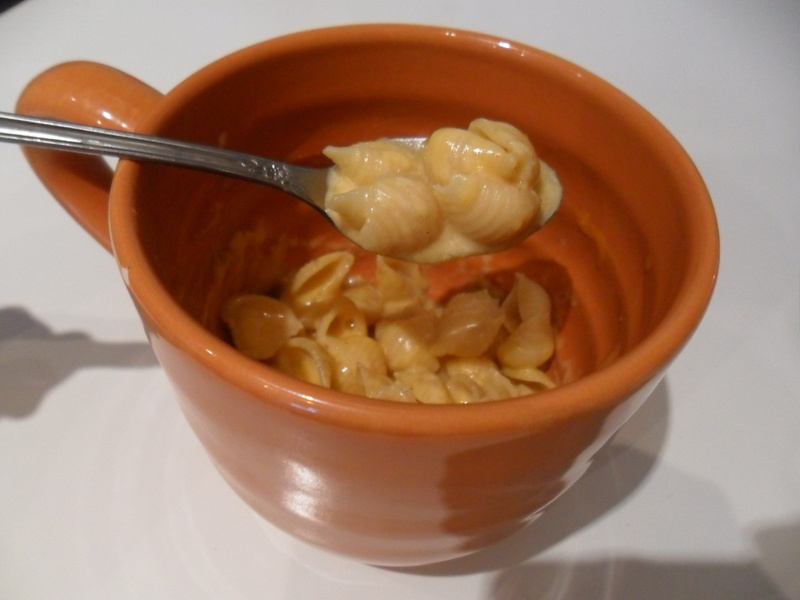 -In a large mug or other microwave-safe bowl, add in pasta and water. Microwave the pasta on high for about 2 minutes; then stir and microwave for 2 more minutes. 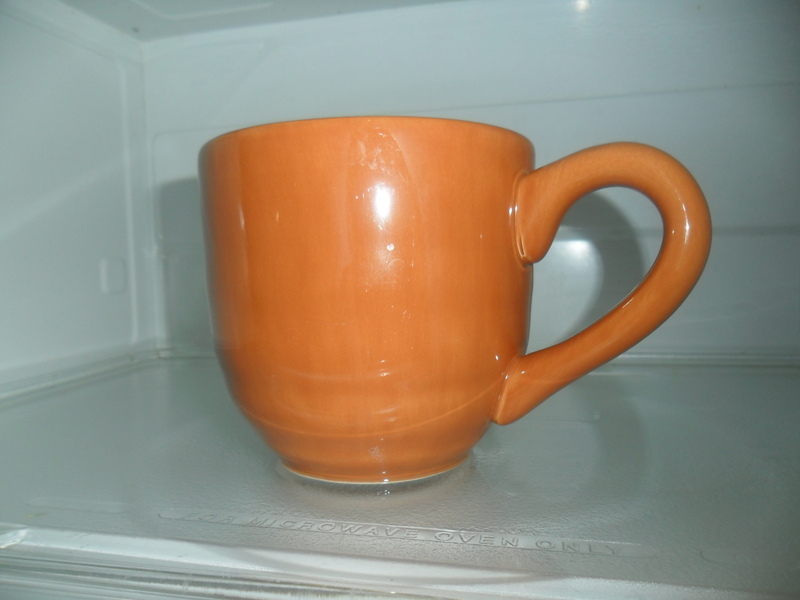 Note: The water may overflow in the microwave, so to prevent this, add a little less. Or if you lose too much, add a T or so more. -If the shells still aren’t soft, repeat microwaving and stirring until they are. Mine were ready after only 4 minutes. -Drain any excess water very well. 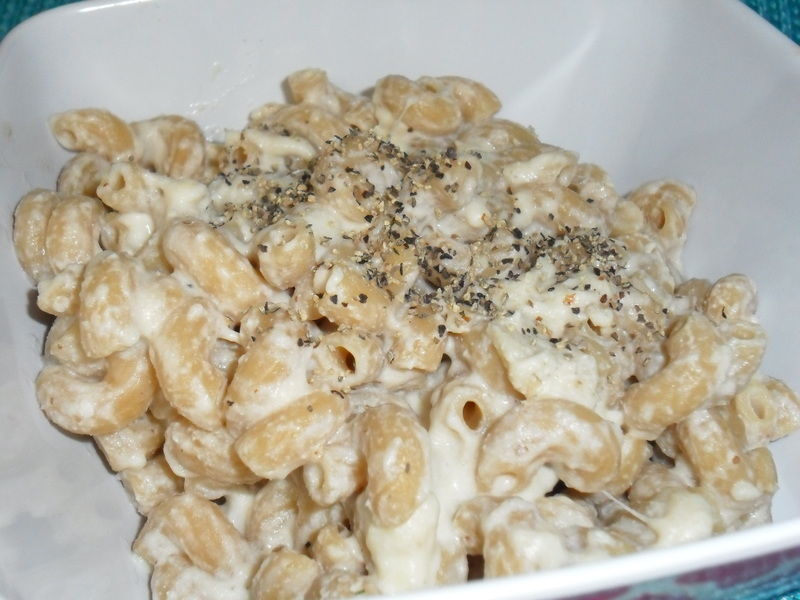 -Mix in cheese, milk, and mustard. You can omit mustard if you like, but I think it gives a really nice flavor. Blend well. 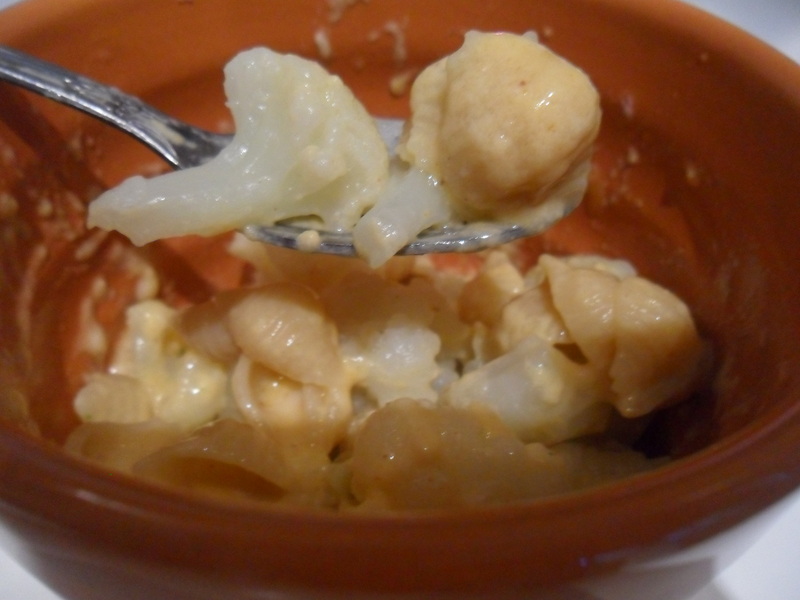 If you want to incorporate cauliflower–which is so good for you and so much like a noodle you probably won’t even notice it!–add in steamed cauliflower now and mix. -Place back in microwave and cook for 1 more minute. Mix again, and serve warm. So I added in 1/2 cup of cauliflower, too. Hey, a healthy girl has got to get her vegetables in somehow. I think this is the perfect way to do that, and you don’t have to feel like you’re tricking yourself because it tastes that good! I’m renaming this recipe from Health.com. Originally, it was titled, Chicken Breast with Shaved Brussel Sprouts, but I’ve adapted. No meat this evening. 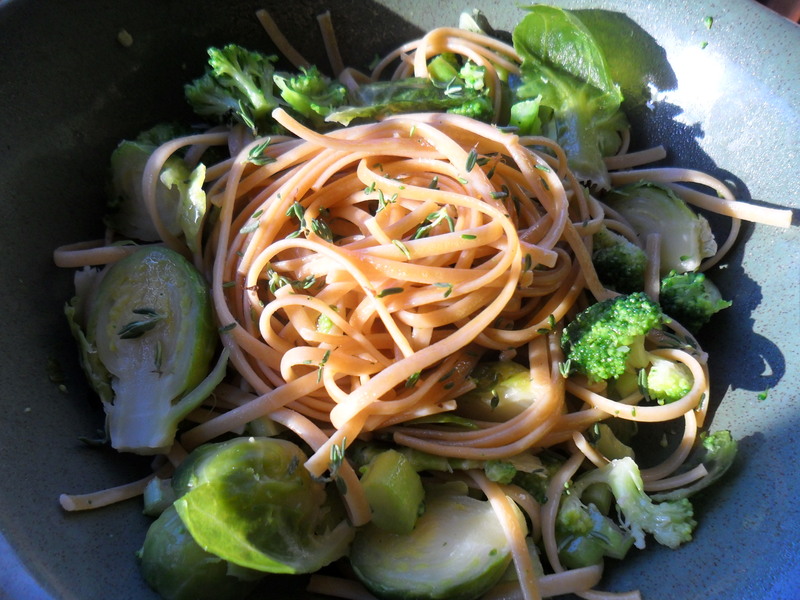 Just some very healthy greens tossed on a warm swirl of light pasta. 1. 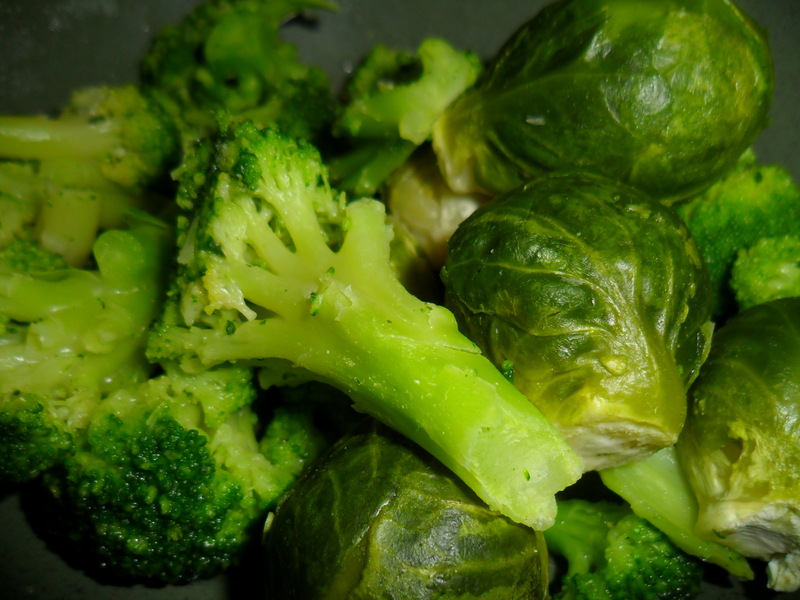 Steam brussel sprouts and broccoli, unless you’re doing broccoli shreds. Then make the shreds using a vegetable peeler and microwave with just a tad of water in the bottom of a bowl for about 2 minutes. 2. Meanwhile, bring half a pot of water to a boil. Add in linguini and cook ’til al dente (better for the blood sugar, you know). Once cooked, drain in sink. Toss with a little olive oil. 3. In a new bowl, toss greens with celery, thyme, parsley, seasonings, a little more oil and lemon juice. 4. Place pasta on top of seasoned greens. 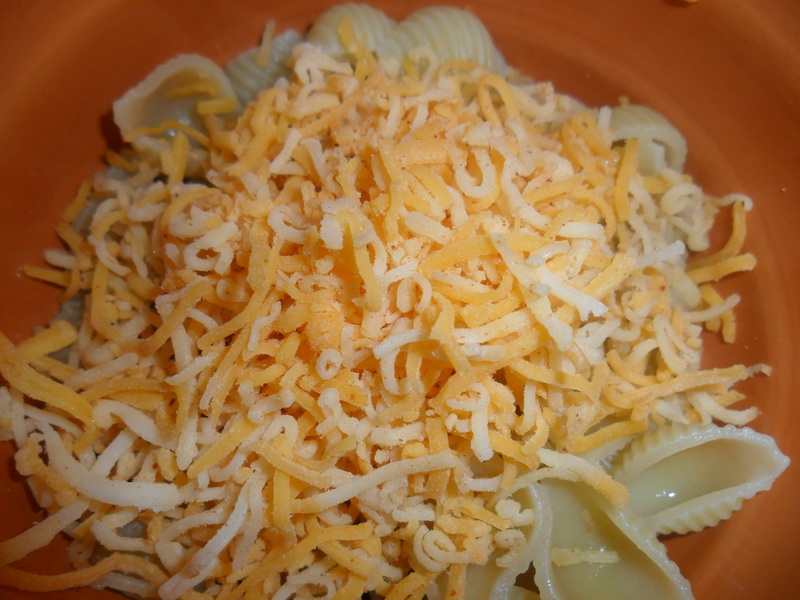 Swirl noodles and top with more thyme or cheese. Serve warm. On a porch somewhere. Preferably, you should be watching the sun set after a long, fulfilling day. 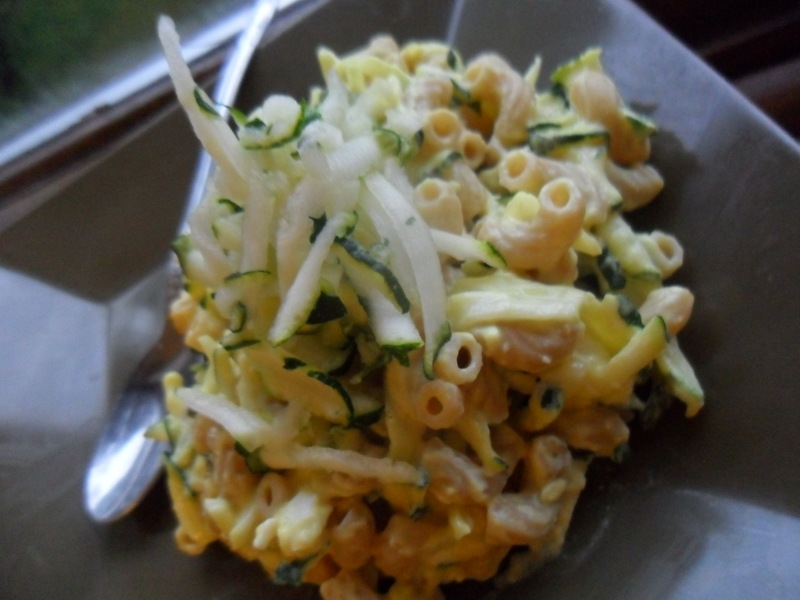 Or if you’re day was less than fulfilling, well, maybe this healthy pasta dish can change that. 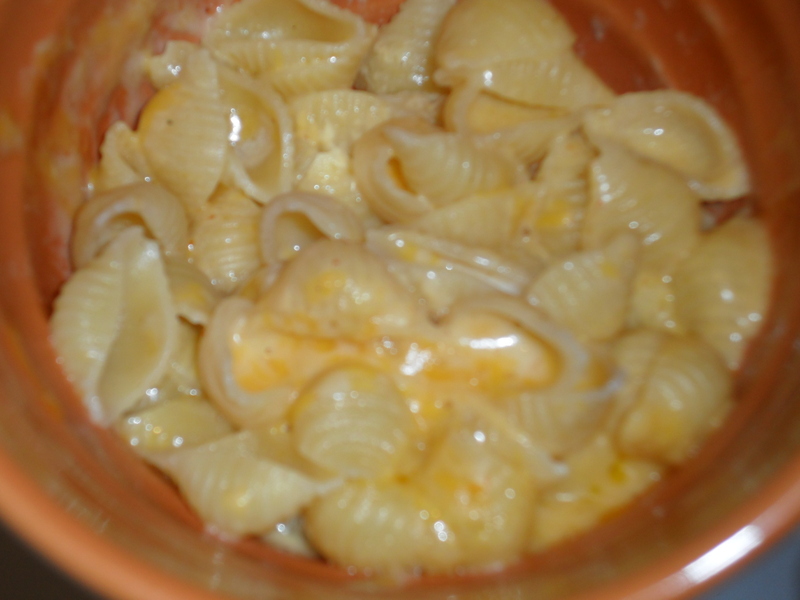 So a fellow foodie blogger, a Miss Macaroni and Cheesecake, called this recipe “revolutionary.” It’s been rumored that it might be Panera‘s secret to delicious mac-and-cheese. I don’t know if all that’s true, but it was good! I made a single-serving just for you, but with a ricotta twist for extra creaminess. 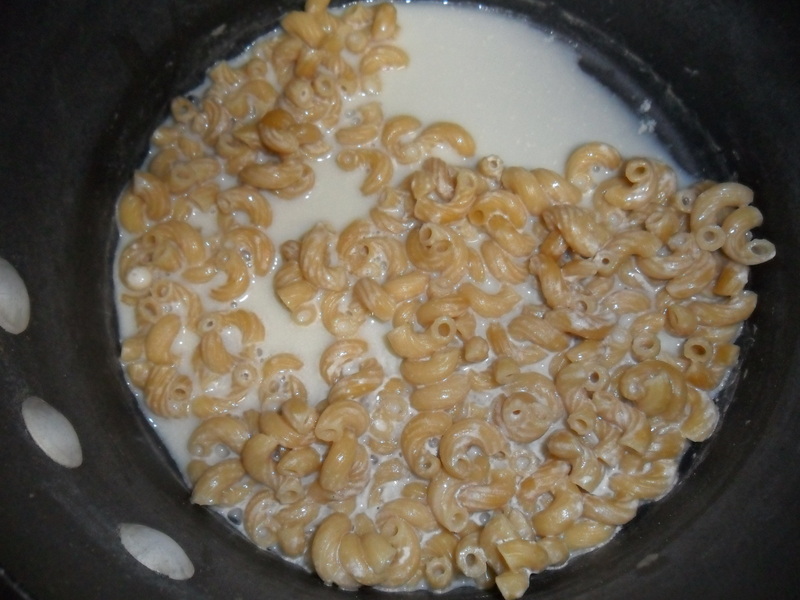 -In a small saucepan, add pasta and milk. 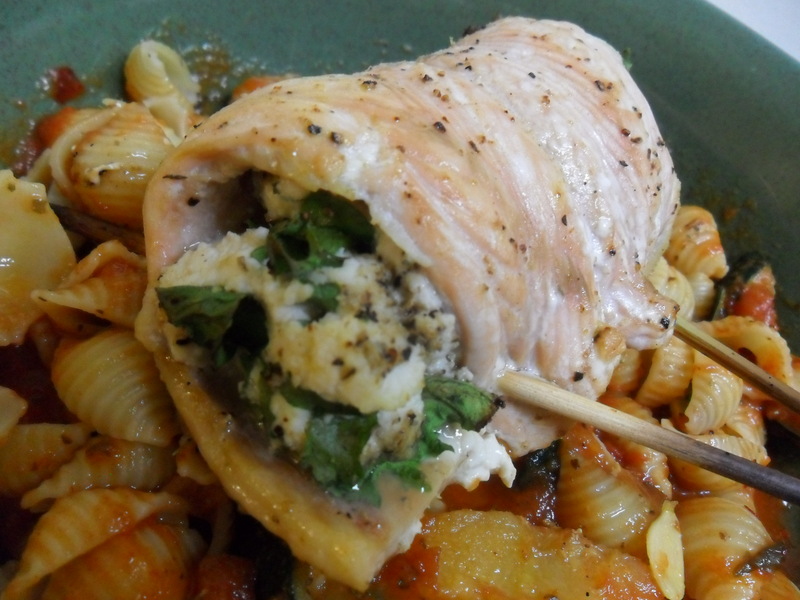 Bring to simmer, then reduce heat to low and cook for 20 to 25 minutes, until pasta is soft, stirring frequently and ensuring milk does not boil. -Turn heat off, add cheese and stir ’til cream forms. -Stir in the mustard or nutmeg & cayenne a little at a time, to taste. -Cover and let stand for a couple of minutes, then stir again and serve. If not creamy enough, add milk a little at a time, and gently stir. 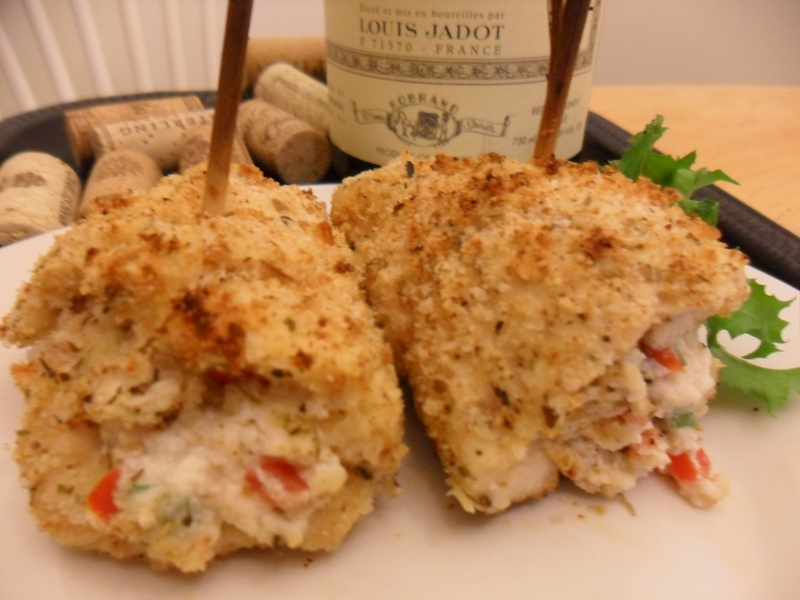 You could also bake this in a dish with some breadcrumbs on top (try 375 degrees for about 4-5 minutes or until cheese is bubbly). I opted instead for a healthy mix-in: fresh kale. 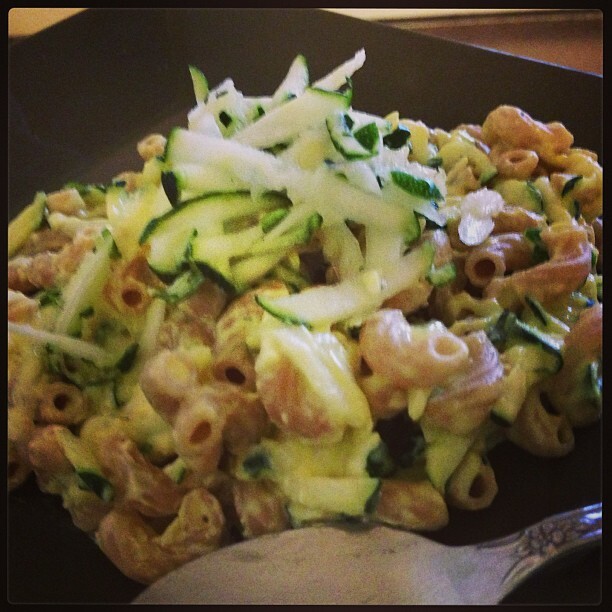 I paired the creamy mac with baked tilapia, and needless to say, I dined well on a poor girl’s dime.